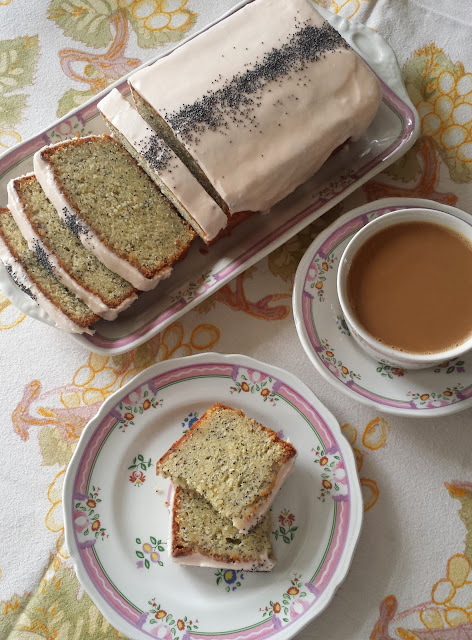 It has always been my intention to use this blog not only to share good recipes, but also to teach basic cooking methods. If you have a working knowledge of good technique, any recipe you choose to prepare will be better. Unfortunately I now find myself at the point where I have been keeping this blog for long enough that I sometimes forget which techniques I have described in detail. As I was thinking about the salad recipe that I am posting today—a wonderful winter platter of avocados, arugula, olives and citrus—I began to wonder if I had ever taken the time to talk about preparing citrus filets (or, as they are sometimes called, citrus suprèmes). I was surprised to discover that I had not. So, before I share the recipe, I'll begin with a description—along with a few pictures—of how to prepare citrus segments that are perfectly free of membranes, seeds, bitter white pith and peel. In this state they are ready to add to today's salad....or any other citrus salad you have in mind to prepare. Set the fruit so that it is resting on one of the flat, cut surfaces. Using a thin, sharp knife, cut away the rind in strips. As you cut, follow the contour of the fruit with your knife and use the previous cut to guide where you make the next cut so that you remove all of the peel, pith and membrane...but as little of the flesh as possible. Slice from top to bottom and rotate the fruit as you make each cut. You should end up with a smooth, sphere of citrus that is free of membrane, pith and peel. My hands and motions stay in the same place as I work. I rotate the orange...not my hands or my body position. At this point you may either release the segments of the fruit (the filets or suprèmes referred to above)...or simply slice the fruit cross-wise into round pinwheels (as in my Clementine, Avocado and Pomegranate Salad). Either style of cut is beautiful in a salad...and salads with both kinds of cuts (as in today's recipe) are especially attractive. To release the citrus filets, hold the fruit over a bowl (to catch the juices as you work and to receive the filets). Begin by carefully slicing along the right side of the first segment (between the flesh and the membrane), slicing as close to the membrane as possible. Cut only as deeply as is necessary to release one side of the segment. Make a second incision on the left side of the segment. This second cut should end where the first cut ended and the filet should easily fall out. Rotate the fruit in your hand and repeat this action on each successive segment until all the segments have been released. You may find that after releasing the first filet it is unnecessary to make a cut on both sides of the segment. If, as you are completing the cut on the right side of the segment, you rotate your wrist slightly to the right you will find that this will cause the blade to nudge the segment up and away from the core of the fruit. As you continue to gently rotate and push upward the segment will pull cleanly away from the membrane on the left side and fall neatly into the bowl. Either method (two cuts per segment, or one) will work, but you will find that if you can release the filets with only one cut each, you will conserve more of the flesh of the fruit for your salad. When all of the segments have been released, give the membrane that is left in your hand a good squeeze (as if you were wringing out a cloth or a sponge) so that as much juice as possible will be extracted. If you happen to be working with a seedless specimen, your work is done. If however there are seeds, you will need to fish them out of the bowl and discard them. If you aren't going to use the filets right away, store them in a container, submerged in their juice. They will keep in the refrigerator for several days. I realize that in my instructions I have assumed you are right handed. If you are left handed, simply reverse the instructions for releasing the segments (make the cut on the left side of the segment first...if you are using the "one-cut" version of releasing the successive segments, rotate your wrist to the left, etc.). The citrus salad I'm sharing today was inspired by a recipe in Suzanne Goin's Sunday Suppers at Lucques. Her salad is a simple and classic combination of citrus and avocado, enhanced by tangy-salty green olives and peppery greens. It is a delicious salad (perfect for brightening up a dreary winter day) and I have taught it exactly as published in my Winter Salads class for years. But one day this past week I made a slightly altered version for my lunch. I liked it so well it is probably the version I will teach in the future. The original salad includes watercress and frisée lettuce. These are lovely in the salad, but the frisée is not reliably available in my area. Moreover, it can be quite expensive. Watercress too can be difficult to find (and even when it is available, its quality isn't always so fine). Fortunately all of the interesting greens and lettuces aren't quite so hard to come by. Arugula of good quality is widely available. Because I love it I tend to keep it on hand anyway. It echoes the peppery contribution of the watercress...as well as the slightly bitter note of the frisée. I have also altered the vinaigrette slightly. Goin includes some of the mixed citrus juices in her vinaigrette. I have left them out...their addition always made the salad seem slightly soggy to me. The flavor of the citrus is still front and center without them and the resulting sharper vinaigrette is a perfect foil for the rich avocado and peppery arugula. For my version of this salad I like to toss all of the elements separately. This allows me to arrange them in a purposeful way on the plate. But it would probably be fine to simply place all the ingredients in a big bowl and toss them together. When prepared this way, the salad might not be quite so beautiful on the plate....but it will still taste delicious. With some multi-grain toast...a satisfying winter lunch. Prepare the citrus fruits: One by one, cut the stem and blossom ends from the fruit. Place each fruit cut side down on the cutting board and following the contour of the fruit with your knife, remove the peel and cottony pith—working from top to bottom, and rotating the fruit as you go. When the fruits are all peeled, hold them one by one over a bowl (to catch the juices), and carefully slice between the membranes and the fruit to release the segments. When all of the segments have been released, squeeze the membrane to release the juices into the work bowl. If you're using blood oranges, don't cut them into segments; after removing the peel and pith, slice them into pinwheels and set aside on a small plate. (They will "bleed" into the other fruit.) Discard any seeds that you find. You may store all of the other mixed citrus filets in one bowl or in separate bowls...as you prefer. If not serving right away, store the citrus filets in their juice. When ready to serve remove the filets from their juice. (The juice may be used for another preparation...or enjoyed as a refreshing drink.) You should have a total of 3 cups drained citrus fruit. Prepared citrus, sliced avocado and macerating shallots. Make the vinaigrette: Combine the shallot, the vinegar, lemon juice and generous 1/4 t. kosher salt in a small bowl. Let sit 5 minutes. Whisk in the olive oil. Taste and correct the balance and seasoning. When you are ready to make the salad, halve the avocados and remove the pit and peel. Cut the avocado into scant half inch wedges, and place on a plate or a tray. Season with salt and pepper and drizzle with vinaigrette. Season the blood oranges with salt and drizzle with some of the vinaigrette. Place the drained citrus segments in a large bowl and drizzle in two or three tablespoons of the vinaigrette. Season with salt and toss gently to combine. Place the arugula in a small bowl, season with salt and pepper. Drizzle in a very small amount of vinaigrette and toss to coat. The salad may be built on individual serving plates or on a large platter. To build, scatter half of the arugula over the plate(s). 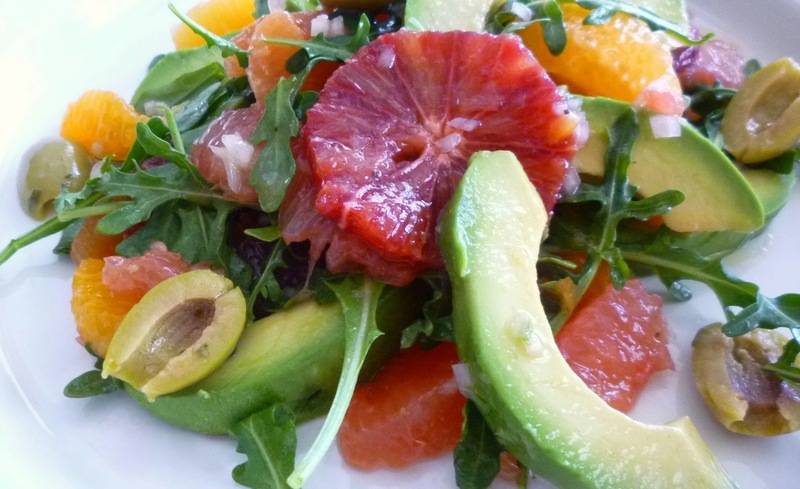 Arrange half of each of the other elements (blood oranges, mixed citrus, avocados and olives) over and among the arugula. Repeat this layering a second time. Drizzle any remaining vinaigrette from the bowl of mixed citrus over the salad(s) and serve.